When we hear about charities in the gaming community, what usually comes to mind are gaming companies donating to charity or encouraging players to donate to a charity drive. Today, Benjamin 'Fogladha' Foley talks to us about the "Double-Up" charity drive, a community endeavor which has shattered expectations and shown the power and giving of the gaming community. This drive, in coordination with the existing Kohl's Cares program, encourages community members to purchase stuffed animals. Kohls will donate 100% of the net profit from these purchases toward childrens' health and education. 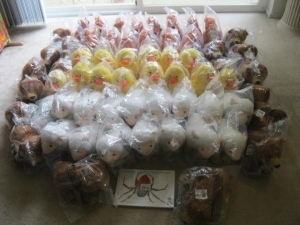 Through the Gaiscioch program, instead of purchasing these stuffed animals to receive, they instead purchase through a registry for the stuffed animals to be shipped to Oregon, where Foley donates the stuffed animals to various charities. 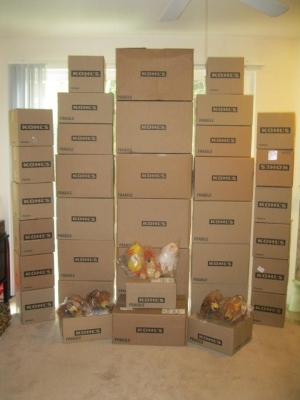 To the right, you will see an image of the first shipment of the animals received by Raphael House in Portland Oregon, which is a multifaceted domestic violence agency which serves individuals and families of all backgrounds, cultures, and ages. Also recipients of the animals were Insights, a nonprofit agency devoted exclusively to the needs of parenting adolescents and their children; and the Bear and Buddy Program, which provides the animals for times when police officers, detectives, and Records Division personnel come in contact with children who have been involved in traumatic incidents. The next shipment will be received by Candlelighters For Children With Cancer which provides support, education, advocacy and hope to all children and their families affected by childhood cancer in Oregon and SW Washington. According to Foley, the drive has been successful to the point where additional charities are needed for the stuffed animals. So then I found the Kohl's charity event that for any animal that you buy they donate 100% to childrens' education and healthcare, and figured: Why not double up and give the animals to charity? Anyone who wishes to participate can find more information on the charity page of the Gaiscioch Family website. The drive continues until March 31st and the final shipments are expected to be made in the first week of April. "I've always had a charitable side of me, I ran a DV website for 10 years. It's one of the things I started before the Gaiscioch. We used to help people involved in domestic violence situations. Whereas you'll hear many psychologists tell people that their situation is shared by millions of people, people generally don't want to hear that. They want people to understand their situation, because it's close and personal to them. That's where we came in. We used to counsel people involved in traumatic situations and encourage them to have the strength to see counselors. We helped find a kidnap victim in England with the help of their law enforcement and even innovated several security measures you'll find on DV websites today to protect victims from being found out by their abusers that they are talking to somebody. It isn't something you'll find on my resume, nor do the people I worked with even know it was me individually who was involved. It was my 'secret crusade' after living through some traumatic events in my own life." We will bring you any further announcements or updates about this drive as they become available.